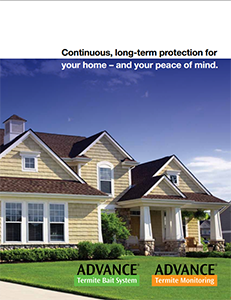 Advance™ Termite Bait System can help rid your home of unwanted termites. 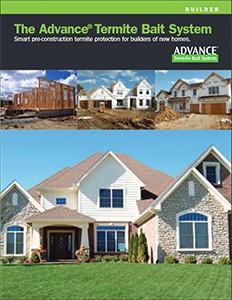 Advance™ Termite Bait System utilizes the latest termite research and technology available. It features the ultra low disturbance station design that keeps termites feeding voraciously on the Puri-Cell™ bait matrix, which leads to colony elimination. The Advance™ Termite Bait System with it’s revolutionary dual stage station design is without question the best bait system to come along in the last 10 years… as well as the system we recommend above all others! 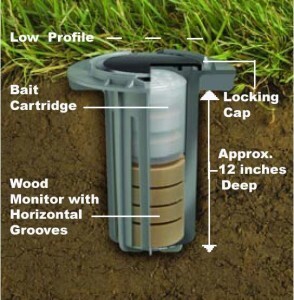 This approach involves installing the Advance™ Termite Bait Stations around the perimeter of a structure at 10-15 foot intervals see (Homeowner Product Brochure) The stations are then checked on a regular basis by the PMP. Upon finding termites in the stations, an active bait cartridge is substituted for the monitoring cartridge which is fed upon by termites and destroys the colony attacking the home or business. With the Advance™ Termite Bait System, Technicians need not enter your residence or business to monitor or treat for termites. Why choose the Advance™ Termite Bait System over other baits? Newest technology available in a sturdy station designed to minimize tampering from children and pets. Offers the latest advancement in termite baiting technology via a dual stage process that features an ultra low disturbance design to pattern termite’s natural feeding behavior, leading to enhanced colony elimination. Features Puri-Cell™, a unique food source preferred in studies by termites over the wood used in most homes. Allows significant amount of bait to be fed to the colony in less time to eliminate your termite colony faster, giving you peace of mind. The Advance™ System can be installed as a “stand alone” defense or (when applicable) combined with other treatment methods such as wall void foam and wood treatment applications. A detailed monitoring Inspection Service Report is left behind following the completion of each quarterly Inspection. This report covers termite activity [hits] at all the Advance™ Station sites located on your property. The report also indicates weather or not we have introduced the active bait matrix [diflubenzuron]. In the field the Advance™ Termite Bait System intercepts termites in as little as 15 to 45 days and eliminates colonies in as little time as 120 days. Low impact to your family and pets, ATBS relentlessly and quickly offers outstanding performance, making it a superior option to all other types of termite control.